At a time such as this. . . The Council of Elders recognizes that no one is untouched by the gun violence perpetrated on members of our human family in the Orlando nightclub, Pulse. Orlando is every city. Pulse is every place. The victims are our churches, our family members, our friends, our co-workers, and ourselves. We are Orlando. 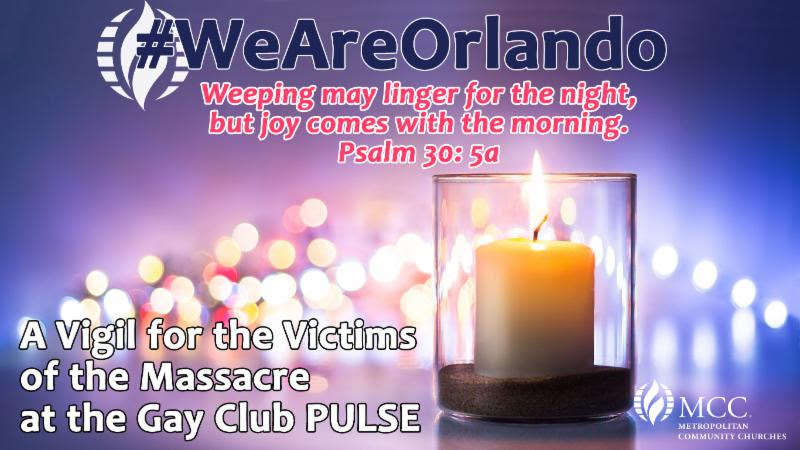 Please join the Council of Elders of Metropolitan Community Churches (MCC) as we host virtual prayer vigils for the victims of the Orlando shootings and for all victims of gun violence. There will be three opportunities for you to join the prayer vigil. Participate in the one that is most convenient for you. Pre-registration is not required. Your Elders acknowledge that there is no safety, no sanctuary — not in an Orlando nightclub on Latino Pride Night, a Xalapa (Mexico) gay club on any night, a Charleston church during Bible study, or in so many other places that are too numerous to name. Gun violence is one of the most frequent and deadliest ways used to express hatred toward others based merely on the other’s race, religion, gender, sexual orientation, gender identity, or some other vulnerability. Even random bullets can cut us down as we walk our streets, sit in our parks, and relax in our homes. Gun violence is growing exponentially across the world and particularly in North, Central and South America. We demand and we fervently pray that lawmakers everywhere commit to passing sensible gun legislation immediately . . . at such a time as this. Please join us in a virtual vigil to share our grief and to pray for the victims and for ourselves as we mourn the loss of so many beautiful and promising lives that ended far too soon in Orlando early last Sunday morning. Sign on early because space is limited to the first 100 who sign on. Wherever possible, we encourage churches, organizations, families, and groups of friends to gather in one place and sign on together to Adobe Connect so that more than 100 individuals can join the vigil. Your own written prayers and comments can be posted to the Facebook page MCC Fast & Prayer Vigil for Justice, where additional information is also available. We are holding you in our prayers and look forward to praying with you during the vigil.